If you are into Black, these luggage tags will fit right in! You can find several different varieties that will fit whatever need you have. 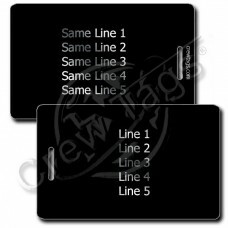 We have Black Plastic Luggage Tags printed with your own information in white, silver chrome, or gold chrome ink. 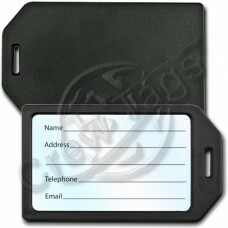 If you want to be able to change your information quickly on the fly, we have a variety of Business Card Holder and Privacy Protection Luggage Tags too! They are simply the easiest, fastest and best way to spot your bag anywhere you might be!